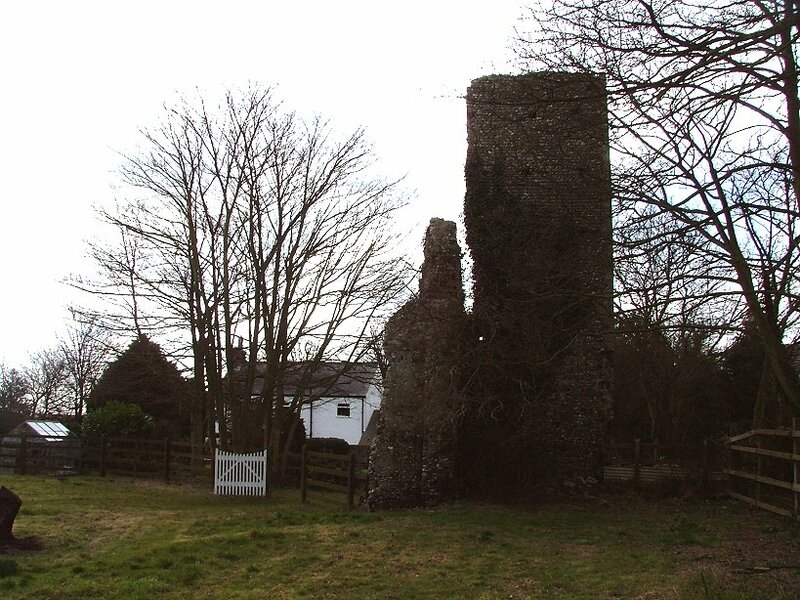 In a small garden at the back of its 1850s replacement is all that remains of a substantial medieval parish church, St Edmund of West Caister. 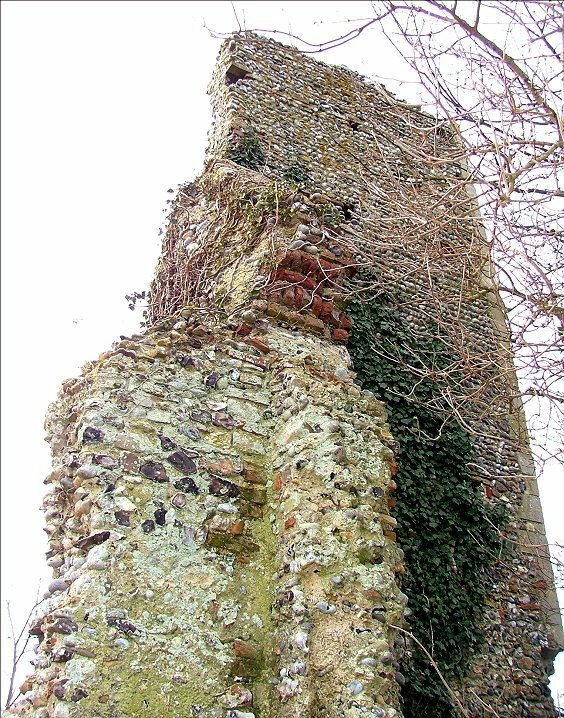 What survives is roughly the lower two thirds of the north side of the tower, buttressed to the south in its west corner, and part of the west wall of the north aisle, including the spring of the arcade. In the low winter light it looked rather as if it was the snaggle tooth of an enormous dragon, and Chris Harrison tells me that it is only in recent years that it has been stripped of the ivy and elder that overwhelmed it. From the south, the hanging dead strands of ivy and the multiplicity of putlog holes creates an extraordinary effect, like a cliff face in the rain forest. To an extent, the damage has been done. 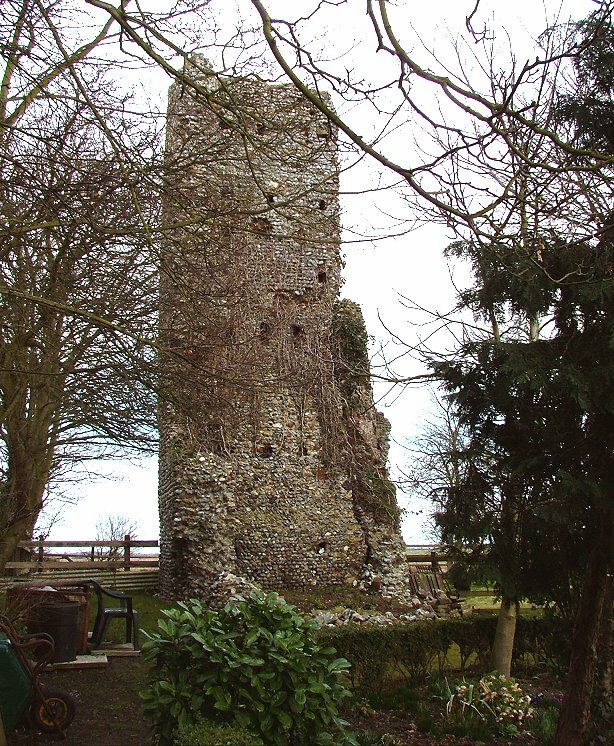 The stone dressings in the bottom north-west corner of the tower have fallen away, and it won't be long before the freeze-thaw action of successive winters causes the collapse of the rest. It isn't clear to me when the dereliction here happened - was the old church still in use until the Victorians built the new one to replace its decaying form? Or was it a much older abandonment, and the new church evidence of the 19th century Anglican revival? There are certainly no old gravestones around to suggest a date. 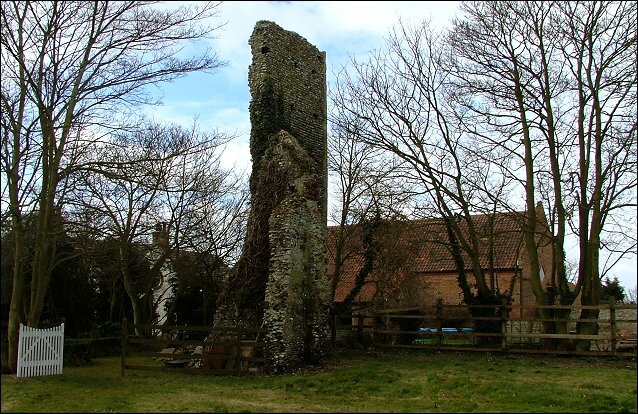 However, the tower must have been pretty well complete until the end of the 19th century, because West Caister is the site of the 'maiden's tomb' legend, a popular East Anglian folk story. 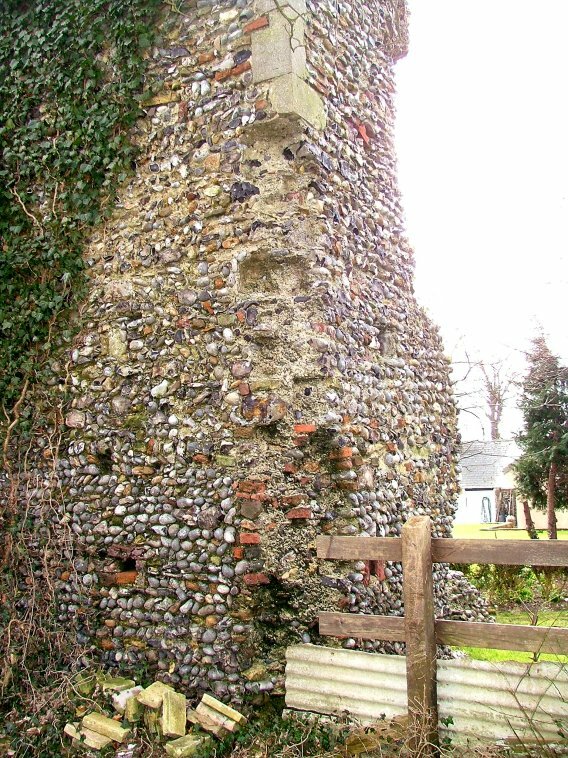 This referred to the pyramidical top of the tower, actually a fairly common 17th century decorative device, which was said by locals to be the final resting place of a certain young woman. She had promised herself in marriage, against her parents' wishes, to a sailor; but she died while he was at sea. They agreed to her last wish, to buried in such a place that he might see it from the sea. Nonsense, of course, but romantic all the same.